Print at rapid output speeds of up to 130 pages per minute for as little as one-third of a cent per print. Get your message out to large groups of people quickly and economically, without sacrificing print quality. Easily guide the user through step-by-step operations for any print job with the panel's brightly lit Multipurpose LCD graphics. Using the single Start Key eliminates the problem of pressing the wrong key when making masters and printing, virtually eliminating output errors. Print on a wide variety of paper stock - including construction paper and card stock. This type of versatility is perfect for educators whether producing tests, flyers or permission forms on plain paper or generating report cards and posters on heavy stock. Government agencies have the flexibility to produce multi-page documents quickly and inexpensively while maintaining a professional look. The larger 11" x 17" scanning area is great for text books and the Auto Center/Edge Erase function eliminates unsightly binding margins, making documents more readable and attractive. Add a bold splash of color to your documents with optional, quick-changing color drums and Ricoh's standard color inks. 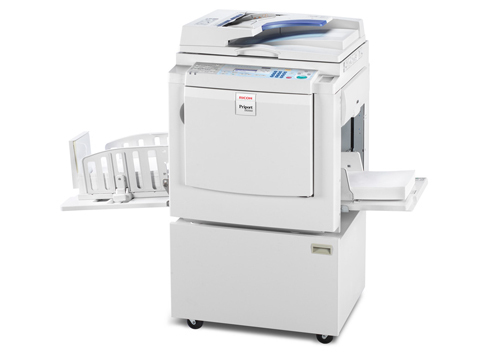 Two controller options allow you to print documents directly from your Windows PC, the VC-20 for local printing or the Type 4545A with network capability. When you connect your Priport DX 3343 using the Type 4545A Embedded Controller, you can take advantage of additional Ricoh software solutions such as @Remote, WebImageMonitor and more. The revolutionary Snap Open Master Eject Box disposes of masters quickly and neatly with no fuss and no mess. Since digital duplicators do not require heat as a component of the imaging process, they use much less power than other imaging devices. The Priport DX 3343's Instant Start Up Technology requires no warm-up time, further reducing energy consumption. The Automatic Shut-Off function completely shuts down the unit after a user-specified period of inactivity making it even more energy efficient than units with only an energy saver mode. Complies with the RoHS and the WEEE directives to conserve the environment.